Into the forest I go... to lose my mind and find my soul. Incredible cabin nestled on a hill on 66 very private acres. H'Owl at the Moon Farm was completed in 2016. Relax and unwind under incredible stars and listen to the night sounds of frogs, crickets, owls, and sometimes coyotes. Close proximity to James River and tubing, UVA, and many wineries. You won't see any neighbors but you will see millions of stars and gain the serenity that can only come from unplugging from the world for a few days. No wi-fi, no cable, and, unless you have Verizon, no cell signal. Feels remote yet only 20 minutes away from all that Charlottesville has to offer! Cabin is conveniently located in the heart of the Virginia wine, beer and cider trail. While many popular attractions await you, most guests decide that returning to the cabin is the highlight of each day. Guided winery and brewery tours available for $200/day (1-4 guests, 8 hours) based on availability of car and driver. Inquire any time. Although easily accessible, the roads leading to the cabin and the driveway are all gravel. I have never had any problem with friends getting to the cabin in everything from a Tesla to an RV. That said, don't wash and wax your car and expect it to stay that way :-). All Access, Including 66+ acres to hike and explore. I also have an agreement with my neighbors who lease 500 surrounding acres which you can hike and four-wheel in all months but mid September - early January (hunting season). Treat the house as if it were your own. Bring horses or four-wheelers but absolutely no shooting of any animals of any kind (in or out of season) without my expressed and prior approval. I live locally (but not close) and am available via phone and email to answer any questions or to visit in person if desired. Sometimes I am around to greet guests in person. When I am not, the caretaker Diana will check with you on arrival day to make sure you got settled in and answer any questions you may have. *** Note that this listing is 'pets considered' please do not send a booking request without first sending an inquiry. I need to know the type and number of pets prior to booking. I don't charge a pet fee but am selective about the number and type of pets I will allow. *** Please do not split weekends unless booking a full week. If booking a Friday or a Saturday only, please inquire before sending a booking request. Since most renters book full weekends, 1/2 weekends usually lead to vacancies. I am more flexible about this during non-peak season. I spent two years looking for a unique property that had it all -- views, interesting topography, mix of woods and pasture, some water, total privacy, and no weirdness like meth-cooking neighbors, traffic noise, or power lines. Well, I finally found it. And I LOVE LOVE LOVE it. Oddly enough, I love it so much, I enjoy sharing it with others. Quiet, Peace, Serenity, Wildlife, Beauty, Stars, Privacy... That about sums it up. Gourmet Kitchen featuring new high-end appliances and local soapstone counters. Absolutely the best get-off-the-grid getaway! Definitely going back! Escapism at its best! The setting, cabin, hiking, and did I say setting were everything described and more; there are no adequate adjectives. We definitely plan on going back, with the same friends, doing the same things. Thank you for sharing you home, allowing renters to make wonderful memories. Very nicely appointed cabin. Peaceful location with great views and awesome hiking with Jack the dog off leash. Needed a place to decompress from the city and this was just what the doctor ordered! Dr Ho’s is as good as advertised. Thank you Jeff. Glad the cabin offered you a peaceful respite from city life. You and Jack are welcome to return anytime! My girlfriend and I really enjoyed staying at this property. Our dog had plenty of room to run around and the cabin is nicely modern while still feeling rustic. And, Bill has a great sense of humor. Sitting on the back deck with a Scotch and a cigar while listening to the silence was the perfect way to unwind from our normal DC life. Dr. Ho's Humble Pie pizza is a must and there are wineries, distilleries and cideries within a short driving distance. We will definitely be staying here, again. One last thing, if you stay here you will get the chance to meet King Kong (stay here and you'll understand). He's really a nice guy. 20 STARS out of 5!!! My wife, Sarah, and I are regular VRBO users and this was by far one of our best stays ever! The cabin is absolutely gorgeous, sparkling clean, and with all the modern amenities, including plenty of hardwood firewood. Our stay was a needed respite from “real life;” and the Farm made for an easy step back to a more peaceful, reflective space and time. We were lucky enough to be greeted by Bill, who welcomed us on a cold, drizzly afternoon by having a cozy fire set in the stove. The photos can’t capture the magic feel of the quiet, safe, sylvan isolation here. Seriously, Bill and his family have hit all of the marks at H’Owl at the Moon Farm. We sorta hate to write a review that we know will make the farm more difficult for US to book a vacancy in the future, but if this place is available on your dates, don’t bother looking anywhere else! See you back whenever the wind blows you this way. Only 8 miles from the James River for tubing, kayaking and fishing. Public boat launch in Scottsville along with guided trips and tube/kayak rentals. Or hit the Charlottesville wine and beer trail -- or hiking trails. Visit historical sites such as Monticello, the Walton Family Museum, Michie Tavern, UVA, and many more. 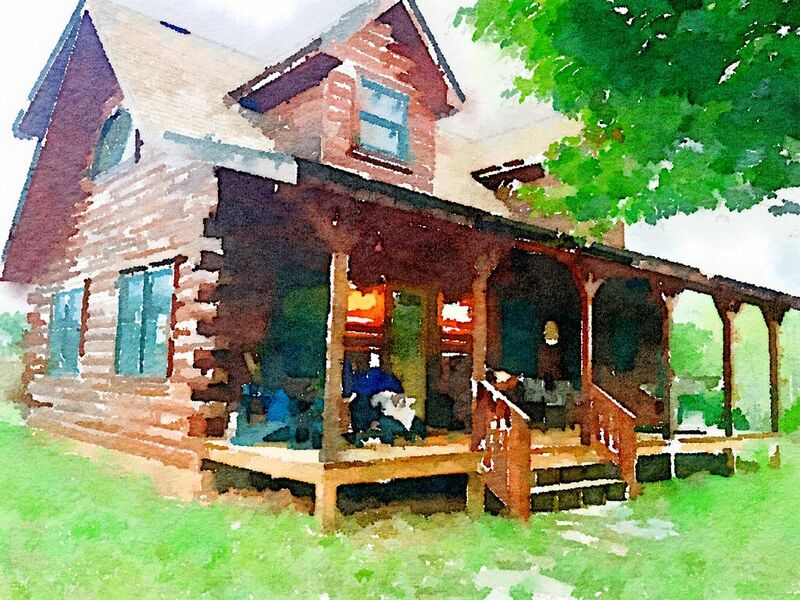 Most guest comment that their favorite thing about the area is coming home to the cabin. You may never want to leave (I don't). Pets are CONSIDERED not automatically allowed. If you want to bring a pet, please send an inquiry first (not a reservation request) and include information about the your pet. I do not charge a pet fee but I am selective about both the animals I allow and the number of animals (limited to 2).